In June 2017 the results were published of a research programme commissioned by The Department for Business, Innovation and Skills (BIS) and the Equality and Human Rights Commission to investigate the prevalence and nature of pregnancy discrimination and disadvantage in the workplace. 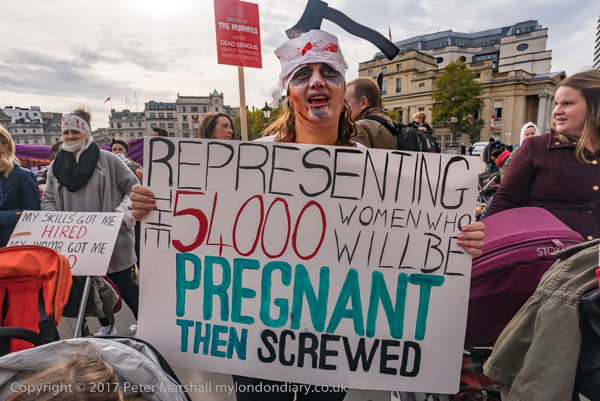 This report showed that every year 54,000 women lose their job for getting pregnant, a figure has almost doubled in the last 10 years. 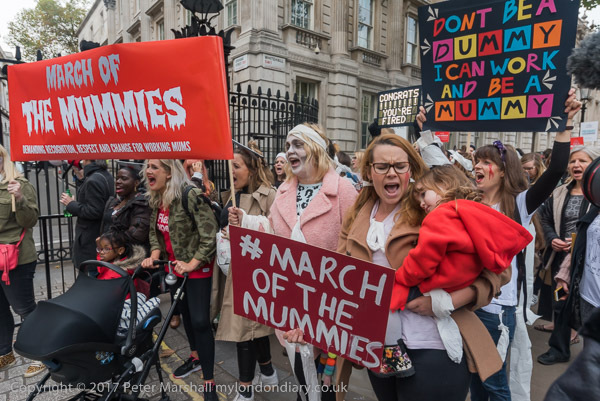 It also demonstrated that 1 mother in 5 felt they had experienced harassment or negative comments related to pregnancy or flexible working from their employer and /or colleagues, and that 1 in 10 had been discouraged by their employer from attending ante-natal classes. 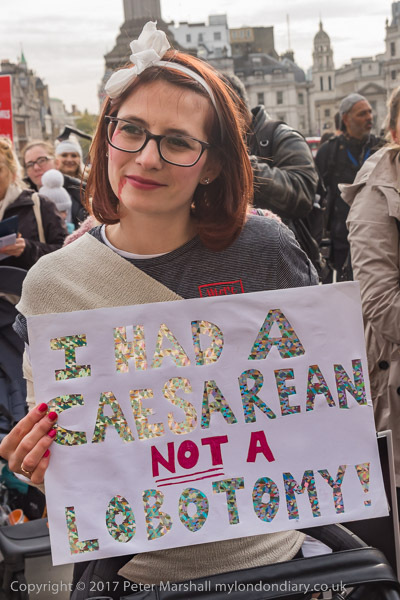 It also showed how difficult it is for those suffering discrimination because of their pregnancy found it to access justice, with less than 1% raising a tribunal claim. And not surprisingly the reaction of the government was to say thank you very much for telling us about it and then to take the usual action of putting the report to one side and hoping it will go away. Nothing has happened and campaign group Pregnant Then Screwed decided to give them a reminder. That reaction had an unusually long gestation period and only emerged kicking and screaming 15 months later, at Halloween and wrapped not in swaddling clothes but in bandages with the odd saw or axe in the head in best zombie fashion. It also came with some clever captions and posters and a tablet with various messages including ‘Stop Ovary Acting‘. 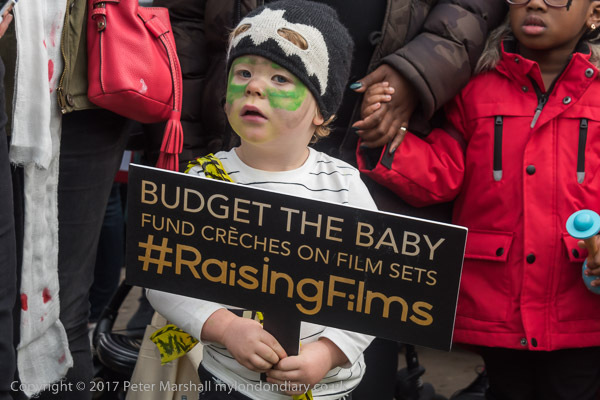 Although it would be easy to make fun of such vital issues as ‘Creches on Film Sets’ it is of course an issue that effects all women, not just those in well paid middle-class jobs, and though those on minimum wage have less to lose, its loss may be even more devastating. 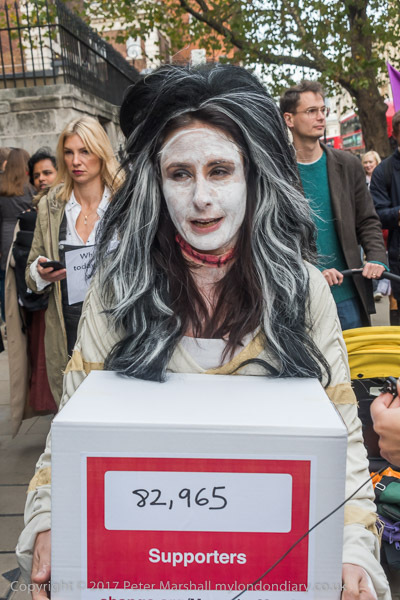 I think I was one of the 82,965 supporters who signed the petition that was being carried in a box on the protest. 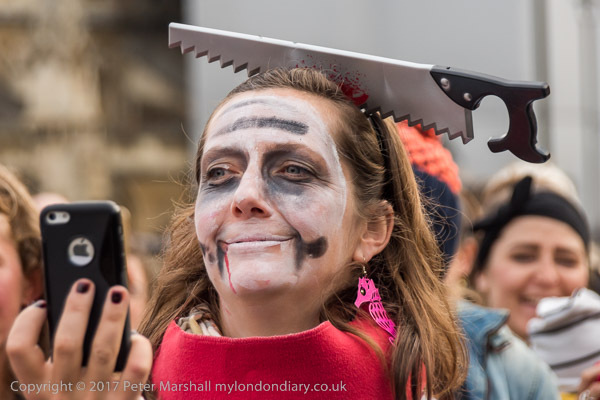 Many of those taking part had gone to some lengths to dress up for the occasion and there was plenty to photograph – and plenty of photographers there to do the business. You can see quite a few of the pictures that I took on My London Diary. This entry was posted on Thursday, April 5th, 2018 at 09:29 am and is filed under My Own Work, Political Issues. You can follow any responses to this entry through the RSS 2.0 feed. You can leave a response, or trackback from your own site.